Pair of Non Return Valves. These are fitted into the shower valve to stop water flowing back. Supplied in a pack of 2. These non return valves are fitted into the shower valve where the hot and cold water supply hoses are connected allowing the water to pass in one direction. 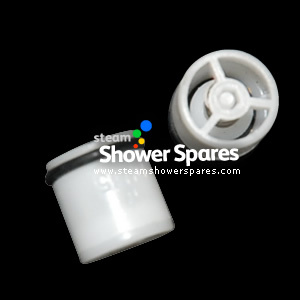 These NRVs are suitable for all shower valve sold by Steam Shower Spares and are standard in shower cabin and steam shower models by Bathtek, AquaLusso, Insignia, Listna Waters, Smartprice Warehouse and many other brand names.